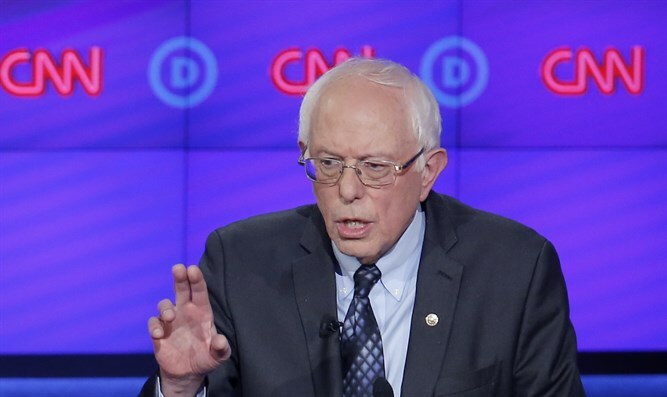 Vermont Senator Bernie Sanders criticizes Israeli government's policy on Gaza, claims it overreacted to border riots. Vermont Senator Bernie Sanders, who sought the Democratic presidential nomination in the 2016 election but lost out to Hillary Clinton, on Monday criticized Prime Minister Binyamin Netanyahu and his policies. "As someone who believes absolutely and unequivocally in Israel's right to exist... we must say loudly and clearly, that to oppose the reactionary policies of Prime Minister Netanyahu does not make us anti-Israel," Sanders told the annual conference of the J Street organization. He took issue with Israel’s response to the recent riots along the border with Gaza, claiming Israel "massively overreacted" to the protests. "The presence of Hamas members among a crowd of tens of thousands does not justify the level of violence we saw, and frankly it’s amazing to me that anyone would find that point controversial," Sanders said. "I have condemned Hamas’s use of terrorist violence and will continue to do so. But that violence cannot excuse shooting at unarmed protesters, and it cannot excuse trapping almost two million people inside Gaza," he charged. Sanders also said that the United States “must play a much more aggressive and even-handed role in ending the Gaza blockade and helping Palestinians and Israelis build a future that works for all." He added that, If the White House does not do that, Congress must take the lead. “Too often, our foreign policy debate here in Washington is dominated by those whose answer to complicated international situations seems always to involve dropping more bombs, rather than engage in the hard work of diplomacy and negotiation,” said Sanders, who opined that the best way to achieve peace between Israelis and Arabs is the “two-state solution”. "If we don't have a two-state solution, what will we have?" he asked, while expressing concern that President Donald Trump has not expressed support for the policy. Sanders, who is Jewish and who spent time in a kibbutz when he was young, has a history of problematic statements on Israel. In another instance, the Vermont Senator suggested that some U.S. funds meant for Israel should be used to help rebuild Gaza. Just two weeks ago, he slammed Israel for eliminating terrorists who rioted on the Gaza-Israel border and who threatened to force their way into sovereign Israeli territory, saying he does not accept the Israeli government's explanation of the eliminations. "You have tens and tens of thousands of people who are engaged in a nonviolent protest. I believe now fifteen or twenty people, Palestinians, have been killed and many many others have been wounded. So I think it's a difficult situation but my assessment is that Israel overreacted on that." Despite claims otherwise, the Gaza rioters were not unarmed. Some of them burned tires and threw firebombs and rocks at IDF soldiers stationed near the border. Others attempted to plant explosives under the guise of protests. They also attempted a shooting attack in northern Gaza. No one was shot at unless they approached the fence in an attempt to breach it. Prior to the riots, Israel repeatedly warned Gazans that "anyone who nears the border is endangering his life."